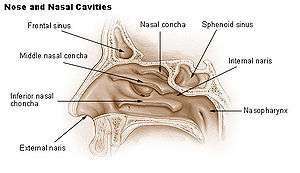 Rhinorrhea or rhinorrhoea is a condition where the nasal cavity is filled with a significant amount of mucus fluid. The condition, commonly known as a runny nose, occurs relatively frequently. Rhinorrhea is a common symptom of allergies (hay fever) or certain diseases, such as the common cold. It can be a side effect of crying, exposure to cold temperatures, cocaine abuse or withdrawal, such as from opioids like methadone. Treatment for rhinorrhea is not usually necessary, but there are a number of medical treatments and preventive techniques available. Rhinorrhea is also associated with shedding tears, whether from emotional events or from eye irritation. When excess tears are produced, the liquid drains through the inner corner of the eyelids, through the nasolacrimal duct, and into the nasal cavities. As more tears are shed, more liquid flows into the nasal cavities. The buildup of fluid is usually resolved via mucus expulsion through the nostrils. Rhinorrhea can occur as a symptom of opioid withdrawal accompanied by lacrimation. Other causes include cystic fibrosis, whooping cough, nasal tumors, hormonal changes, and cluster headaches. Rhinorrhea can also be the side effect of several genetic disorders, such as primary ciliary dyskinesia. In most cases treatment for rhinorrhea is not necessary since it will clear up on its own—especially if it is the symptom of an infection. For general cases, blowing one's nose can get rid of the mucus buildup. Though blowing may be a quick-fix solution, it would likely proliferate mucosal production in the sinuses, leading to frequent and higher mucus buildups in the nose. Alternatively, saline nasal sprays and vasoconstrictor nasal sprays may also be used, but may become counterproductive after several days of use, causing rhinitis medicamentosa. Artist Daniel C. Boyer has created drawings including rhinorrhea. ↑ "Palatal necrosis due to cocaine abuse". US National Library of Medicine. Retrieved 2012-09-21. ↑ "Rhinorrhea". Online Etymology Dictionary. Retrieved 2011-09-21. 1 2 "Nasal discharge". Medline Plus. United States National Library of Medicine, National Institutes of Health. Retrieved 2007-11-01. ↑ "Rhinorrhea Overview". FreeMd. Retrieved 2011-09-21. ↑ "Why Does Cold Weather Cause Runny Noses?". NPR. Retrieved 2011-09-22. 1 2 "Why Does My Nose Run?". Kids Health. Retrieved 2011-09-22. ↑ Smolensky MH, Reinberg A, Labrecque G (May 1995). 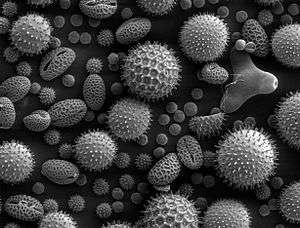 "Twenty-four Hour Pattern in Symptom Intensity of Ciral and Allergic Rhinitis: Treatment Implications". The Journal of Allergy and Clinical Immunology. 95 (5 Pt 2): 1084–96. doi:10.1016/s0091-6749(95)70212-1. PMID 7751526. 1 2 "Rhinorrhea – Definition, Symptoms, Causes, Diagnosis and Treatment". Prime Health Channel. 2011-08-30. Retrieved 2011-09-24. ↑ Dipiro, J.T. ; Talbert, R.L. ; Yee, G.C. (2008). Pharmacotherapy: A Pathophysiologic Approach (7th ed.). New York, NY: The McGraw-Hill Companies, Inc. pp. 1565–1575. ISBN 978-0-07-147899-1. ↑ Welch; et al. (2011-07-22). "CSF Rhinorrhea". Medscape. Retrieved 2011-09-22. ↑ "Opioid Withdrawal Protocol" (PDF). Mental Health and Addiction Services. Retrieved 2011-09-24. ↑ Aubrey, Allison (2007-02-22). "Got a Runny Nose? Flush it Out!". NPR. Retrieved 2011-09-21.